The pekingese is a toy dog breed often described as having a somewhat conceited attitude, which may come to no surprise as the dog was cherished by the imperial family of China for centuries. Despite the dog's proudness, the breed greets family and guests with joy and a good attitude, although they can be wary towards complete strangers. The breed is intelligent, although they can be stubborn which can hinder training. It is recommended that pekingese owners use positive training with a firm yet loving hand. Because of this its generally not a recommended breed for new dog owners. 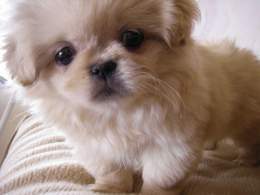 The Pekingese is a member of the Toy group of breeds; these dogs have existed purely as companion animals for centuries. 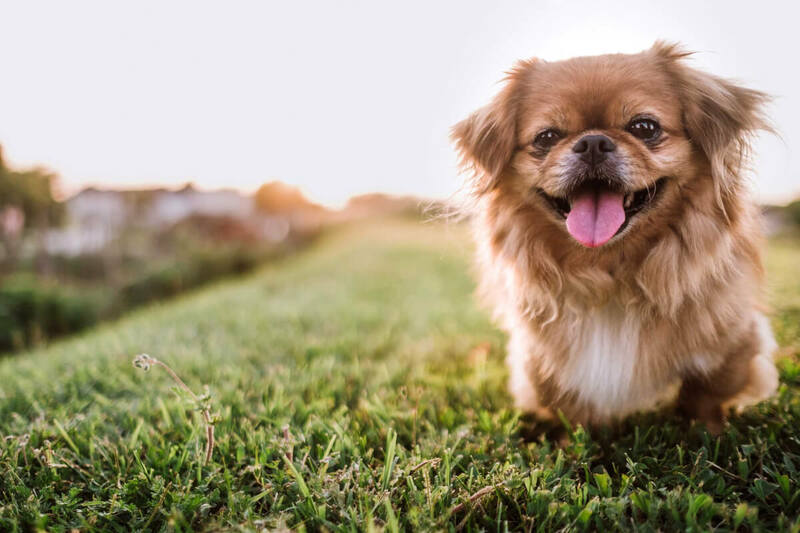 As such, Pekingese are best suited for singles, seniors, and families--but potential owners will need to be able to deal with these dogs' self-important, oftentimes stubborn personalities. The pekingese is classified as a toy dog breed and is generally weighs less than 14 pounds and is less than 9 inches tall from ground to shoulder. The breeds small size makes them a somewhat fragile dog breed as they are at risk of being injured by rough play and/or being attacked by larger prey animals such as large birds. Because of this, they are strictly indoor dogs and should be closely monitored when around children. The breed is known for their bold proud attitude which often creates a love hate relationship with those unfamiliar with the breed. They are loyal and will become protective of their owners towards strangers, however their small size makes this more an amusement than an actual concern for visitors. It is recommended for pekingese owners to socialize their dogs while they are young so they will be a more well rounded adult. The breed has a long, fluffy, coarse coat that surrounds the body. The breed has a noticeable mane which resembles a male lion, which gives the breed its nickname of "lion dog". The long coat needs to be brushed twice weekly to prevent matting and bathed once every few weeks to keep it free of tangles and odors. Pekingese history has its beginnings in ancient China (which is also the "Pekingese" name origin; the Chinese capital of Beijing was formerly known as Peking). One popular Chinese legend states that Buddha once consented to the union of a lion and a marmoset (a breed of monkey), and the first Pekingese dog was its offspring. While this legend is indeed false, the "Lion Dog" nickname has been attached to these dogs for centuries. Pekingese were longtime favorites of Chinese royalty; in fact, for centuries commoners were forbade from owning them. This one-time "royal status" no doubt contributes to the breed's somewhat aloof demeanor even today. The Pekingese breed was thought to exist only in Asia until the mid-1800s, when British troops invaded the Chinese capital during the Second Opium War. There soldiers found several Pekingese dogs, which they brought with them back to England after that war ended. The dogs were presented as gifts to Queen Victoria and other British royalty, and the breed eventually grew in popularity throughout England. Around the turn of the twentieth century, Pekingese became known in the U.S. The American Kennel Club registered the first Pekingese in 1906, and shortly thereafter a handful of owners formed the Pekingese Club of America. 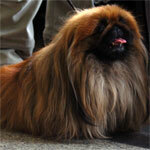 Today, Pekingese can be found in most countries; the breed ranks 93rd out of 189 breeds registered by the AKC. Three words often used to describe the Pekingese breed's overall appearance: small, solid, and regal. A Pekingese's compact body is normally about equal in length and height (though some dogs are a bit greater in length); the front portion of its body is somewhat bulkier than the rear. The head is squarish in shape, as the Pekingese skull is wide and flat, and the jawbone is disproportionately small. The eyes are medium-sized, wide-set, round, and usually brown (though Pekingese with blue eyes are possible); the ears are heart-shaped, hanging, and medium-sized (though an abundance of ear fur makes them seem much longer). The neck is thick but short, the chest broad, the topline parallel to the ground, and the body pear-shaped with a narrow waist. The front legs are short, wide-set, and bowed; the hind legs are equally short, but straighter and closer together. (This leg formation gives the Pekingese its signature "rolling gait.") The Pekingese tail is high-set, medium-length, and is naturally covered with thick fur. 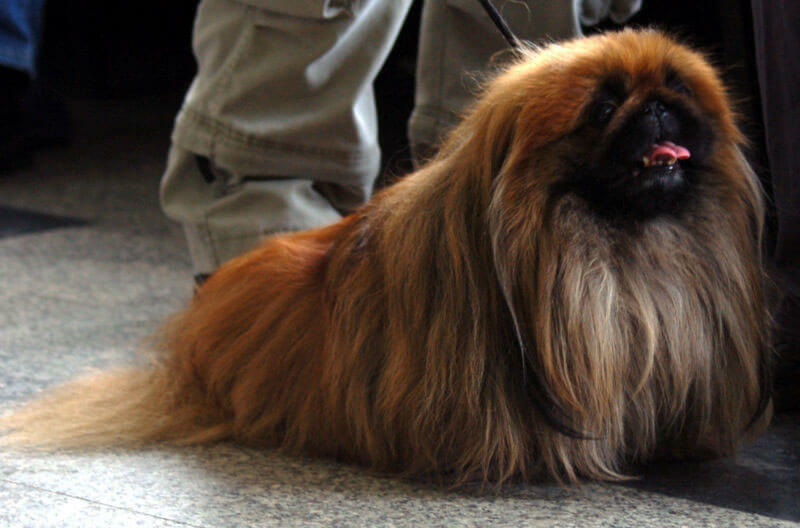 The typical Pekingese coat is long-haired and double-layered; its natural growth pattern has abundant hair on the ears, neck, and tail, which lends to the breed's "lion dog" appearance. Pekingese come in a very wide variety of coat colors, in solid, bi-colored, tri-colored, sable, and brindled patterns. 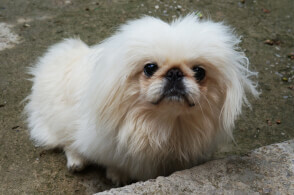 Solid white Pekingese are common, as are black, fawn, gray, red, and various shades of brown. The coats can also be multi-colored in the previously-named patterns, and in combinations of the previously-listed colors. 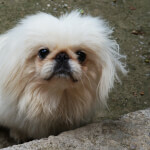 A small percentage of albino Pekingese also exist. These dogs have fur that is a dull white in color, with an almost pinkish hue; some confuse white Pekingese with albino ones--but they are not the same. Albino Pekingese lack some or all melanin pigments in their skin and fur, and usually have pink skin around the eyes, nose, and mouth (whereas a white Pekingese's skin in these areas is black). 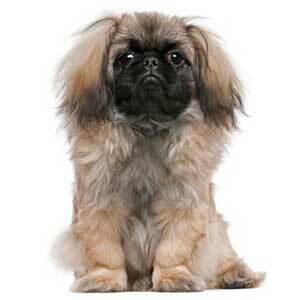 Pekingese size: dogs of this breed are small--but they're surprisingly solid in build. 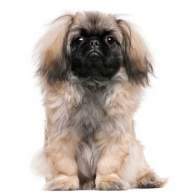 Height at the shoulders is 6-9 inches; Pekingese weight, meanwhile, is 7-14 pounds. The Pekingese breed, in terms of specific physical features, is fairly consistent from dog to dog. The main variation within breed members is size. One specific variant is the Sleeve Pekingese (named so because historically, Chinese royalty would carry these little dogs in the large sleeves of their robes). Sleeve Pekingese have been selectively bred through the centuries to maintain their small size, which averages 4-5 inches in height and 5 pounds in weight. Modern breeders have, through further selective breeding, been able to reduce the breed's size even more. Those breeders offer "Micro Pekingese" or "Teacup Pekingese" for sale, as those names are more recognizable to customers than is a "Sleeve Pekingese." These tiny animals can be as small as 3 inches in height and 3 pounds in weight. 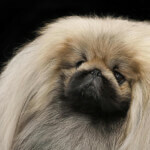 As to coat variations: an overwhelming majority of Pekingese have long-haired, thick, double-layered coats. A Pekingese with naturally short hair is an extreme rarity--and even then, the fur of a "Short-Hair Pekingese," while shorter than usual, is actually medium in length. Active, intelligent, playful, adaptable, and often conceited and stubborn, the Pekingese temperament is one of liveliness and pride. True to their history as royal lapdogs, members of this breed tend to be little "doggy divas," and will usually demand that they have their way. They are, however, affectionate and loving around their human family members--especially if they're raised in a home from puppyhood. The Pekingese personality means their treatment of strangers can range from aloof to pleasant, but standoffishness is the more likely attitude. In regards to training: teaching a Pekingese tasks and commands can be difficult. If it doesn't feel like learning, a dog of this breed can be nearly impossible to train. 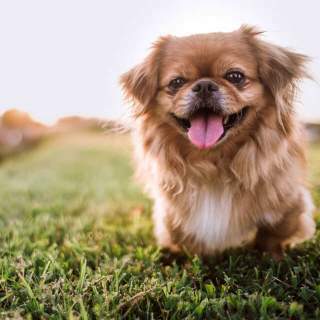 Canine experts say the best way to teach Pekingese is to make training, fun, positive, and reward-based, so the dogs will be more willing to participate; for best results, the experts say, start training a Pekingese as early in the dog's life as possible so that learning is part of its routine. And despite their small size, Pekingese make good watchdogs. Though they obviously can't physically subdue an intruder, they're extremely alert, and will definitely sound a vocal alarm when faced with a potential threat. If the dog grows up with them, a Pekingese and children usually make a pretty good mix. Overall, these dogs are probably better in households with older kids. Regardless of children's age, make sure they know how to treat a Pekingese gently and respectfully; these dogs' small size make them more susceptible to injuries from rough play. Pekingese are known to be "fear biters," and may instinctively snap at anyone who treats them roughly (even if it's unintended). Like with kids, it's best if a Pekingese is raised with other pets. A Pekingese and a cat normally get along exceptionally well, probably because they have similar personalities. Dogs of this breed will tolerate other small animals, but may try to dominate larger ones (especially dogs!) to prove they're in charge. Below are pictures of the Pekingese dog breed. 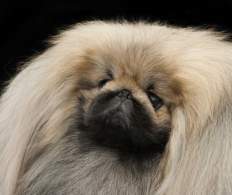 2012 Best in Show winner Palacegarden Malachy: A Pekingese named Malachy took the Best in Show title at the Westminster Kennel Club Dog Show in 2012. The victory, which many considered an upset, marked the fourth time a Pekingese received the honor. The "Lion Dog" legend: An ancient Chinese legend contends that a lion once fell in love with a marmoset (a small species of monkey); the lion asked the gods to be shrunk so it could be closer in size to the marmoset. That shrunken lion, the legend states, was the first Pekingese dog. Sleeve Pekingese were tiny guard dogs: Sleeve Pekingese, a miniature breed variant named so because they would be carried in the large sleeves of Chinese royalty, would pop their heads out of the sleeves and bark crazily when the royal member was confronted with a threat. A Pekingese survived the Titanic disaster: Sun Yat-Sen, a Pekingese owned by an American named Henry Harper (part owner of Harper & Row publishers), was one of only two dogs known to survive the sinking of the Titanic in April 1912. Life expectancy for this breed is 12-15 years. 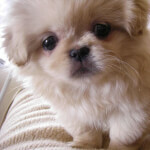 Unfortunately, Pekingese can be prone to quite a few health problems. These include (but are not limited to) structural issues like patellar luxation, cleft palate, brachycephalic syndrome (breathing issues due to the breed's shortened nose), cryptorchidism (non-functioning testicles), and intervertabral disk disease. Pekingese also suffer eye issues including cataracts, Progressive Retinal Atrophy (PRA), and various eyelid and eyelash problems. Potential Pekingese owners should note that their dogs will require more veterinary care than many other breeds.